yet important. 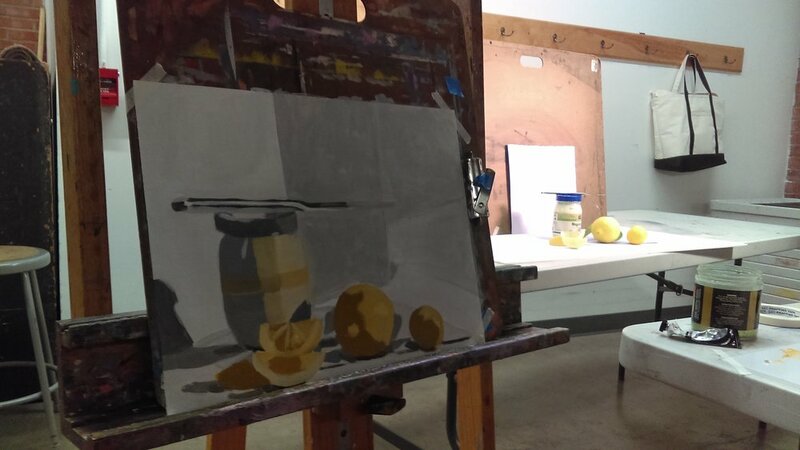 This exercise is designed to help you understand the intrinsic values of pigments, and to key your colors to the underlying values in a painting. Value is cake, color is frosting. The value gives your painting its underlying structure, color is the pretty stuff on top. Set up a still life with some fruit or simple flowers with strong colors and simple shapes. Avoid transparency and ellipses, which present their own drawing problems. We are going to limit the degrees of freedom a bit in the service of learning the core concept. Do a few sketches on paper, or with a brush to design the painting carefully. Use a viewfinder, or your fingers to frame different compositions. This ahead of time thinking is the best thing for your painting to rapidly progress. I will make a post about planning paintings and notans, and sketches, but I don't have one yet. 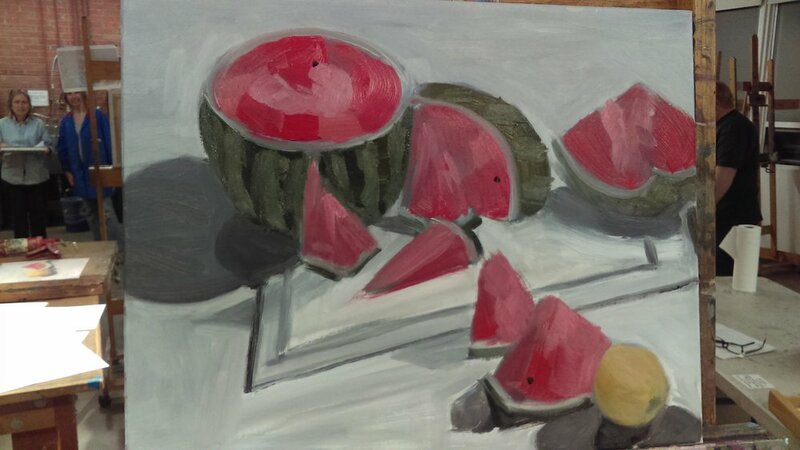 Then, paint the painting in a grisaille (a monochromatic wash painting) in oil paint. use gamsol or turpenoid to thin the paint. Use a chromatic black (dark primaries mixed together), or a burnt umber for this. Dilution with oil will not dry fast enough. Use a cloth,paper towel or colour shaper to restore the white of the canvas in order to get a full range of white to black. Let the underpainting dry (about 10 minutes if you keep it thin), then match the value of the paint you put on top to the value you have washed in with the diluted oil paint. Cake is the grisaille painting, color is the frosting. Paint a thin painting with black and white washes to get the proper underpainting-- the same effect that the oil painters use above. You will need some white paint because of the quick drying of the acrylic paint. Then, paint the final in color painting right over the top of the dried black and white painting. Matching the value of the color you mix to the value of the grayscale painting will help to teach you about the intrinsic value of the pigments. 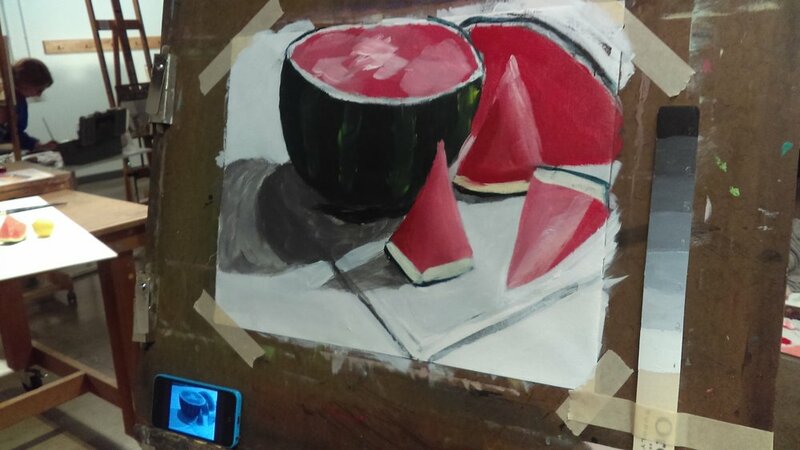 Here is a slideshow of student work from my thursday night class, Painting: Beginning and Beyond. Open Studio this Weekend, 11-5 pm.